When a young architecture start-up in Vietnam went looking for office space, the Farming Architects team, led by founder An Viet Dung, looked to the local vernacular for inspiration. 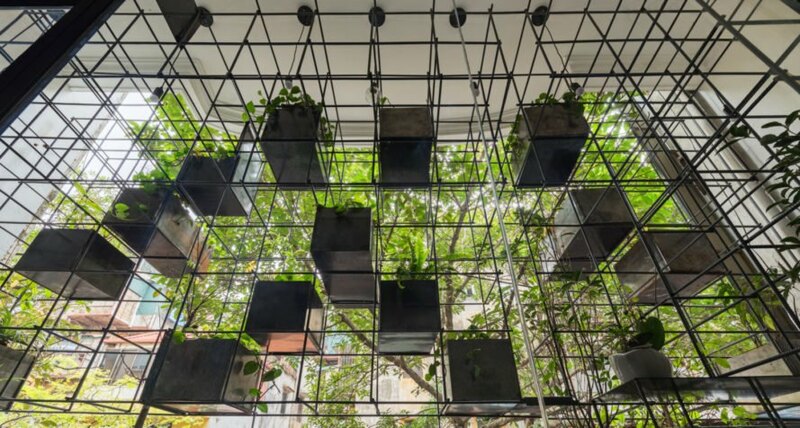 The result is the Urban Eco Balcony, a 376-square-foot office designed to showcase how it’s possible to bring new life to the empty and unused balconies found throughout Hanoi. The interior space is comprised of a unique steel grid system, which was installed with an aquaponic system to breathe new life and green space into the office. 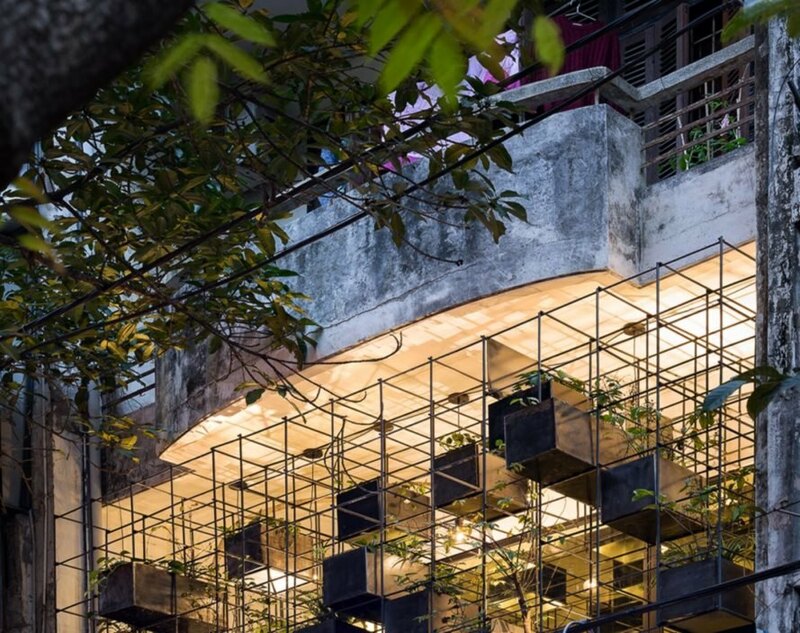 According to Farming Architects founder An Viet Dung, when the budding design practice decided to open its first office in Hanoi, the team realized that the city’s ubiquitous balconies were largely unused, most likely because of urban pollution, noise and even security issues. Using this urban challenge as inspiration, the firm decided to rent a downtown office that would focus on the importance of giving purpose to these “dead spaces.” By using a number of architectural solutions, Farming Architects created an open and vibrant working space, referred to as the Urban Eco Balcony, with various multi-functional features. First, the architects installed a steel girder-tree system that helps create a strong connection between the interior and the balcony areas. Large floor-to-ceiling glass doors lead to the outdoor spaces and welcome natural light inside. The steel grid formations also provide protection from harsh sun rays and help block the rain from coming into the office. Additionally, the steel frames are modular, meaning they can be rearranged depending on necessity. This feature adds a lot of functionality to the office, as the structures can be used as storage, book cases, mounts for additional lighting and more. Perhaps the steel grid system’s best use, however, is to support the office’s aquaponic system, which fills the balcony. Filling the “dead spaces” with plants would be an obvious choice to liven up the work space, but the architects wanted to take it a bit further by creating a system of aquaculture with plants grown hydroponically. This system requires little-to-no maintenance and creates a fresh, healthy atmosphere for the working space. 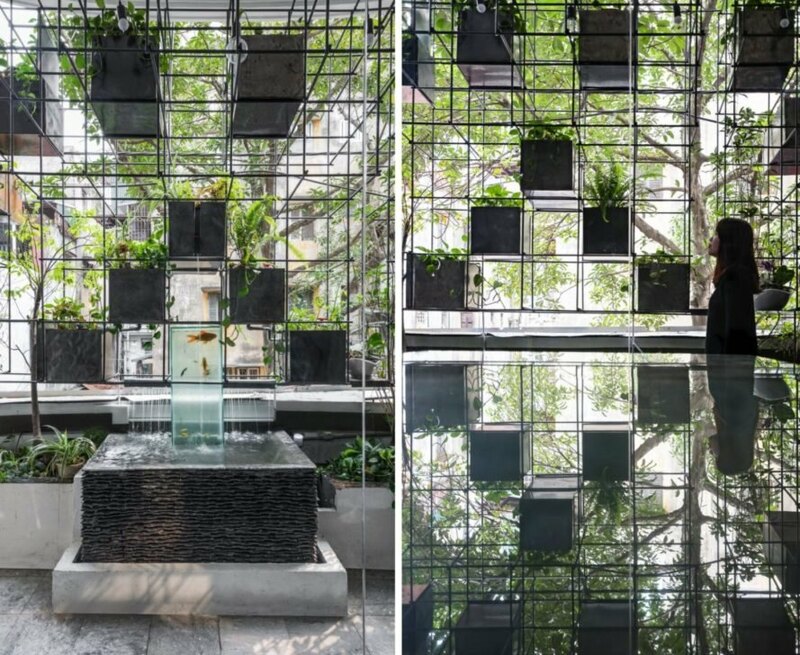 Farming Studio outfitted its new office space in Hanoi with an aquaponics system. The old building had various balconies that were considered empty spaces. 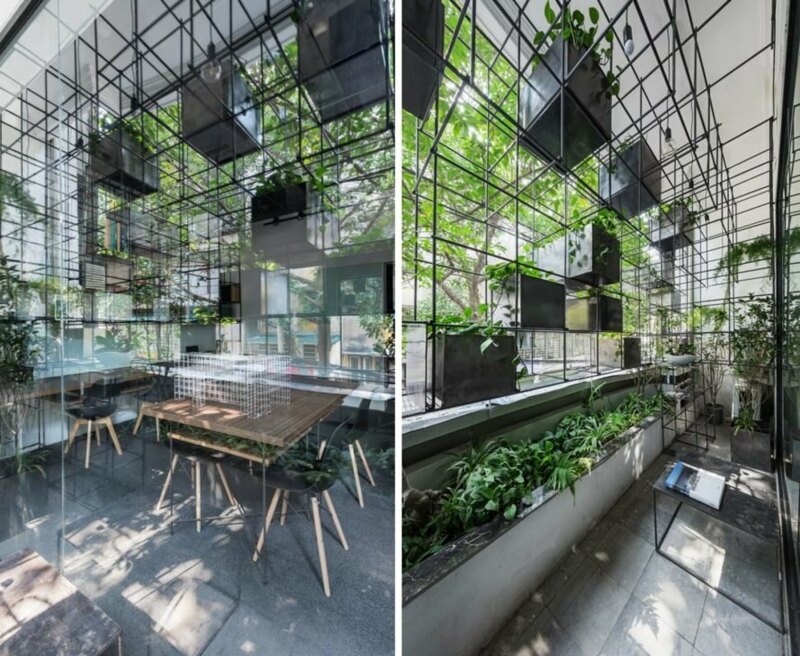 Using a steel grid system, the architects outfitted the space with plenty of greenery. 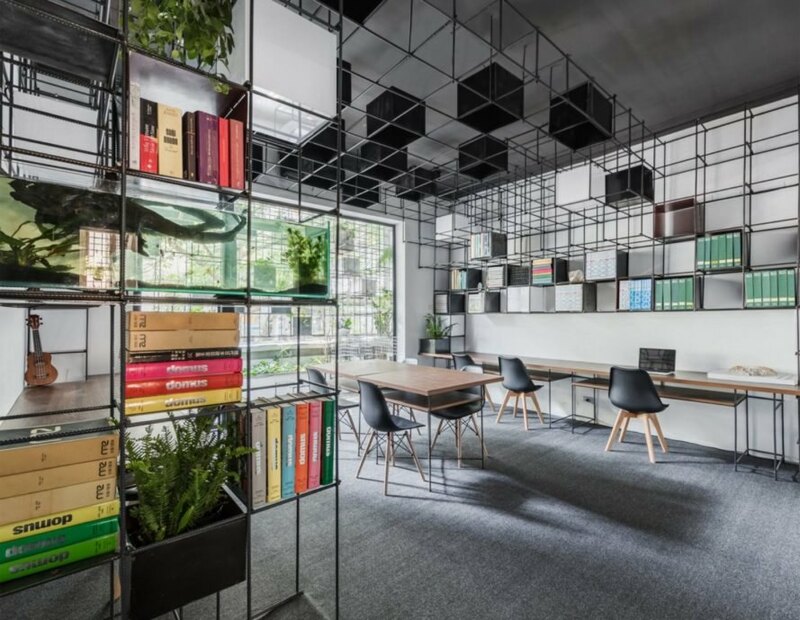 The steel grid helps take advantage of the office's unused space. The working space is vibrant and healthy thanks to the abundance of plants. The grid system enabled the design to take advantage of the high ceilings. The office is installed with plenty of storage. The grid system acts as storage as well. The steel framework allows for optimal flexibility. The aquaponic system relies on natural light. The architect strategically planned the design with an abundance of greenery in mind. The architectural office was designed to be healthy and inviting. The layout is simple but strategic to a productive working environment. The architect sketched out his vision for the aquaponic system.